Our 240 page Summer 2018 issue of Mystery Tribune is a must-have! This volume features must-read short fiction by enduring voices such as Walter Mosley and Brendan DuBois as well stories by Jill D. Block and Erica Wright. 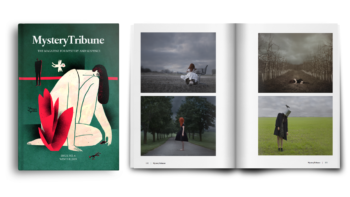 A curated collection of photography from European and American artists, interview with award winning Fabien Nury on noir comics thriller “Black Rock”, and some of the best voices in mystery and suspense are among the other highlights. An elegantly crafted quarterly issue, printed on uncoated paper and with a beautiful layout designed for optimal reading experience, our Summer 2018 issue will make a perfect companion or gift for avid mystery readers and fans of literary crime fiction. Stories by Walter Mosley, Brendan DuBois, Jill D. Block, Brodie Lowe, Rusty Barnes, Erica Wright, J.B. Stevens, Matt Phillips, Tom Larsen, and Jack Smiles. Revisit of the classic essay “The Passing of the Detective”. Interviews and Reviews by Dan Fesperman, Fabien Nury, and Jerry Holt. This issue also features a preview of new Tyler Cross noir comics and a deep dive into the recent work of Scandinavian legend Gunnar Staalesen.